Reduces cholesterol levels, Stimulates liver function, Bloating. Cynara grows easily in the warmer Mediterranean climate. It is often found as part of the diet of those living in these countries, and is considered to be a luxury food. Cynara has a bitter taste due to the presence of cynaropicrin and cynarin, which are found only in the green parts of the plant. They have very specific properties, protecting and enhancing liver function in a way similar to silymarin which is found in Milk Thistle. 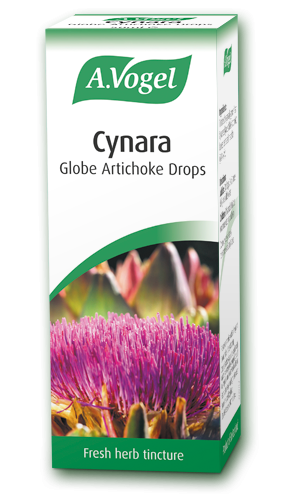 Cynara also contains a group of compounds known as phenolic acids which have the ability to reduce blood cholesterol and lipid levels through their action on the liver. Medical opinion should be sought when acute or chronic liver conditions are present. Do not use alongside medication with the same action, e.g. a tranquillising herb alongside tranquillising medication. Do not take more than three herbal remedies concurrently. Please seek medical advice if pregnant. Do not take if breast feeding. Keep out of reach and sight of children. Adults: 20drops 2 to 3 times daily, in a little water.